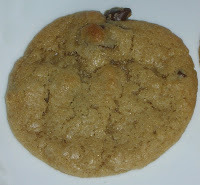 A recipe for the best chocolate chip cookie I have ever had! It’s made with butter, so it’s hard to go wrong. I remember the day my friend told me about this recipe. She urged me to go to Alton Brown‘s website and find this particular recipe. Being the Alton Brown fan that I am, I found and tried the recipe right away. At that time, the recipe had 525 reviews and 5 out of 5 stars. Today, 661 reviews and still 5 stars. Did anyone rate it less than 5 stars? I doubt it. I personally can’t see how they could do it. It is hands-down the best chocolate chip cookie I have ever tasted. And I have tasted a lot of chocolate chip cookies. Alton asks you to sift the flour, salt and soda together, and I rebelled and did not do this step. Actually, the truth is that I don’t have a decent sifter and, more importantly, I am lazy. I’ll admit it. I just put them in one at a time when it calls for dry ingredients, and I do the flour last. I know, I know… I’ll get a sifter someday. No promises, though, about how often I will use it. Melt the butter and add it to the mixing bowl. I used salted butter, rather than unsalted, because it was what I had in my fridge. If you do that, just be sure to cut your salt down to 1/2 tsp. Add the sugar and brown sugar and cream on medium speed. Add the egg, yolk, milk, and vanilla, and mix until well combined. Slowly incorporate the dry ingredients until thoroughly combined. Stir in the chocolate chips. Isn’t it lovely? And dough made with real butter instead of shortening is definitely worth tasting before baking!! While I’m thinking about it, I should mention that I agree with Alton on the bread flour. I keep a small amount on hand, though I use it only rarely. This recipe is one of the few reasons to keep it in the house at all. He also recommends that you let it chill for a couple hours. When I made them, I was short on time, so the dough only chilled for 45 minutes. 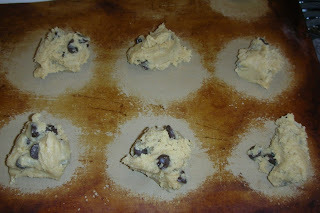 Alton calls for a #20 disher to scoop these onto the baking sheet. I have never been one to scoop cookies with an ice-cream scoop, (and therefore I don’t own one appropriate for cookie dishing) so I just used spoons. Boring? Maybe. I do wonder, though, how big the #20 disher is. I suspect it is pretty big, because Alton calls for baking at 375 degrees for 14 minutes. I did mine at 350 for about 10-11 minutes, and they were plenty brown. This might also be a good time to mention how much I love baking with a stone. The one I use came from Pampered Chef and I have used it for several years. My husband dropped it and broke a corner off, so I can now make only 9 cookies at a time, but I still use it. I love that it cooks evenly, doesn’t require parchment paper, and is so easy to clean. The cookies came out beautifully. 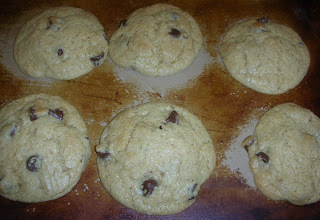 They are just a touch crunchy, mostly chewy, with gooey chocolate chips and a wonderful buttery flavor. Perfection, thou art a chocolate chip cookie!! Do yourself a favor and eat one right out of the oven.